I had some homemade condensed milk in the fridge and did not want it to go to waste. I decided to make something using only what I had on hand, no trips to the store or spending any more money. 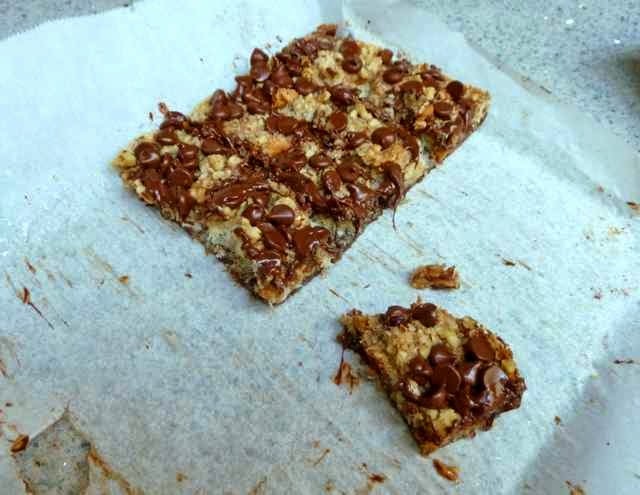 I had most of the ingredients for seven layer bars, but had not made them in a long time. I forgot how good they were. Yum. 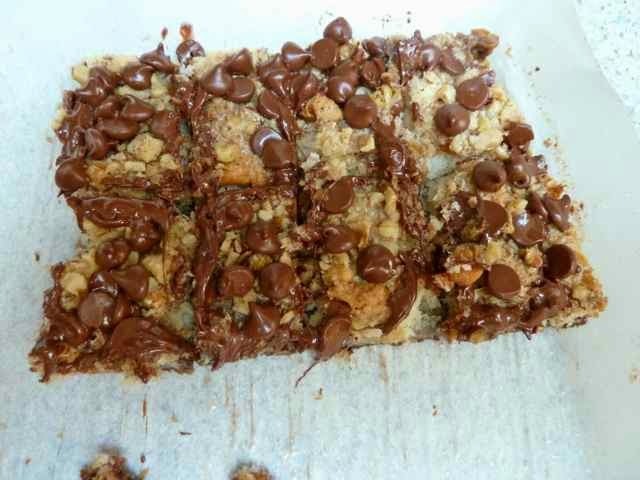 Magic or Seven Layer Bars are easy to make. There are not seven layers but actually seven ingredients that are sort of layered to make it. The bars are moist and scrumptious. 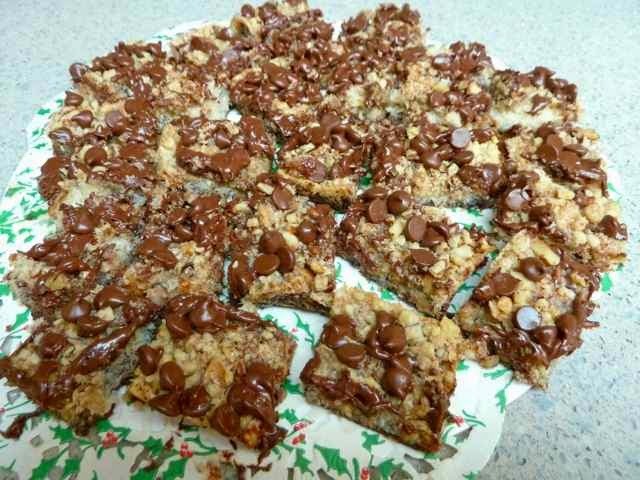 A delightful harmony of coconut, chocolate, cookie crust and nuts, with a few other ingredients that you can change up to your taste. My recipe called for butterscotch chips, which I did not have. Not a staple at my house and not sure they are even gluten free. **I decided to add some home made peanut butter “chips” instead. I took about 1/3 cup of smooth organic peanut butter (the kind with only peanuts listed as an ingredient) and added confectioner’s sugar, a spoonful at a time, until it became less sticky and I could roll it into small balls. It soon became clear that it would be easier to just roll the peanut butter into ropes and cut the ropes into pieces. Then the pieces were dropped randomly over the other bar ingredients. I was quite happy with the results. Not only did it taste great, but I did not have to spend $3-4 on a bag of chips! Yay! Making my own peanut butter "chips". My crust was made with a combination what I had in the house: homemade vegan graham crackers and a few store bought crisp chocolate cookies. Again, saved $3-5 on buying a box of cookies and used left over cookies up before they became stale. Double yay! This recipe is full throttle with dairy. I will post a dairy free/vegan version soon. GF Cookie Crumbs - Graham Crackers are usually used but you can use chocolate or vanilla cookies or a combination of any of these cookies. 1 cup Chopped Nuts (Walnuts or Pecans work best, but you can use whatever you like. 1 cup Butterscotch or Peanut Butter Chips or Homemade Peanut Butter “Chips” ** (see notes above). Preheat oven to 350℉. 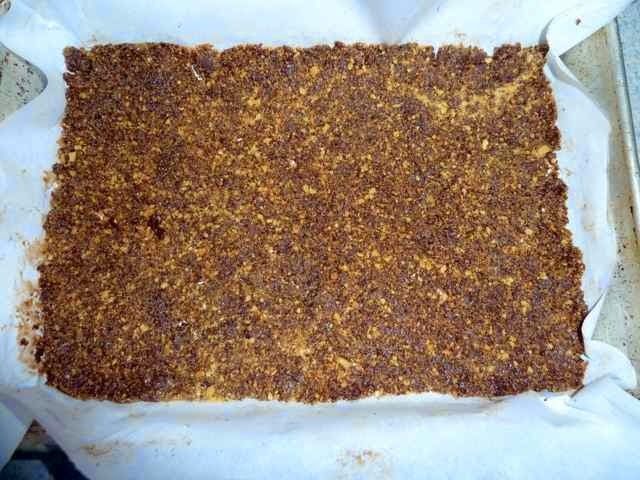 Prepare a 9” x 13” pan by lining it with parchment paper or foil. If using foil grease the foil with butter to prevent sticking. Melt butter. In a bowl mix the melted butter and cookie crumbs. Spread the crumbs out evenly over the bottom of the pan. mixed with melted butter and spread over a parchment lined pan. 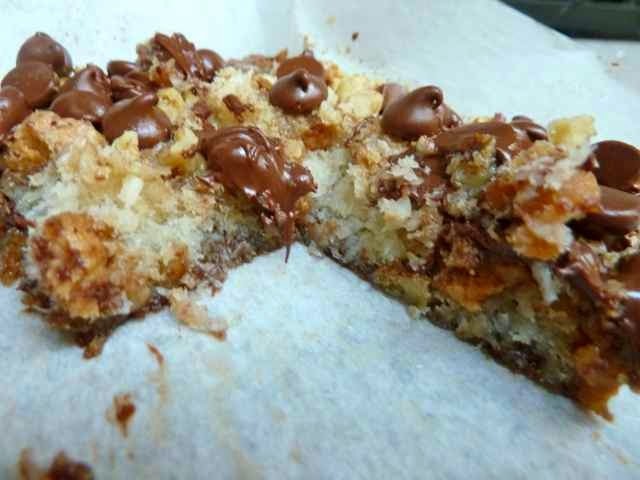 Pour the condensed milk evenly over the cookie crumbs. Spread the coconut evenly over the condensed milk. Then spread the chips and nuts and/or other ingredients of choice over the coconut. Press down firmly but carefully with a fork. Raw bars ready to be baked. Cool in the pan for 10 minutes then transfer the uncut bars, still on the parchment paper or foil, onto a rack to cool completely. When completely cool cut into squares of desired sizes. Cutting the cooled recipe into squares. Best when eaten within two to three days. Store in a tin or plastic container, and separate layers of bars with waxed paper to prevent sticking. Well wrapped squares can be frozen and thawed later when ready to be eaten. 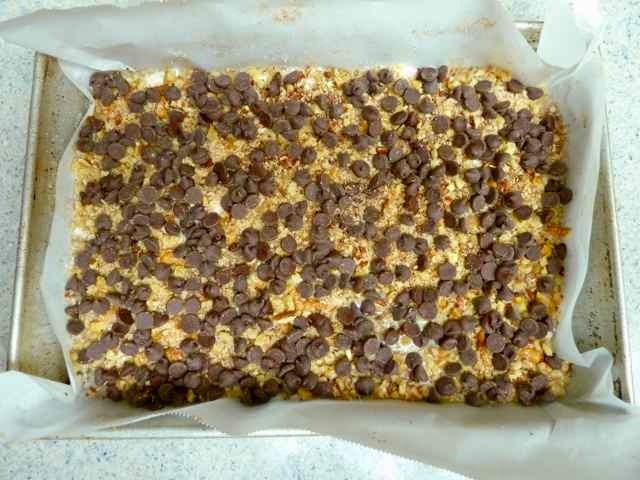 GLUTEN FREE SEVEN LAYER BARS aka MAGIC BARS Makes about 30 bars Ingredients 1 1/2 cups = 7 1/2 oz. if hand crushed or 5 oz. if bought already ground up GF Cookie Crumbs - Graham Crackers are usually used but you can use chocolate or vanilla cookies or a combination of any of these cookies. 4 Tbs. Melted Butter 1 1/4 cup/14 oz. 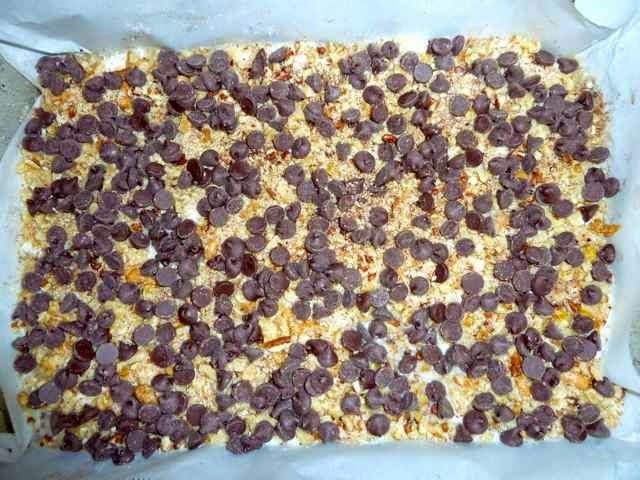 can Sweetened Condensed Milk 1 1/3 cups Unsweetened Shredded or Flaked Coconut 1 cup Chocolate Chips 1 cup Chopped Nuts (Walnuts or Pecans work best, but you can use whatever you like. 1 cup Butterscotch or Peanut Butter Chips or Homemade Peanut Butter “Chips” ** (see notes above). You can replace the Butterscotch or Peanut Butter chips with dried fruit like cranberries or raisins OR with mini marshmallows OR M&M type candy OR other candy (like mini peanut butter cups or cut up larger peanut butter cups or chocolate covered creamy mints, etc.) Directions Preheat oven to 350℉. Prepare a 9” x 13” pan by lining it with parchment paper or foil. If using foil grease the foil with butter to prevent sticking. Melt butter. In a bowl mix the melted butter and cookie crumbs. Spread the crumbs out evenly over the bottom of the pan. Pour the condensed milk evenly over the cookie crumbs. Spread the coconut evenly over the condensed milk. Then spread the chips and nuts and/or other ingredients of choice over the coconut. Press down firmly but carefully with a fork. Bake 25-30 minutes or until lightly browned. Cool in the pan for 10 minutes then transfer the bars, still on the parchment paper or foil, onto a rack to cool completely. When completely cool cut into squares of desired sizes. Best when eaten within two to three days. 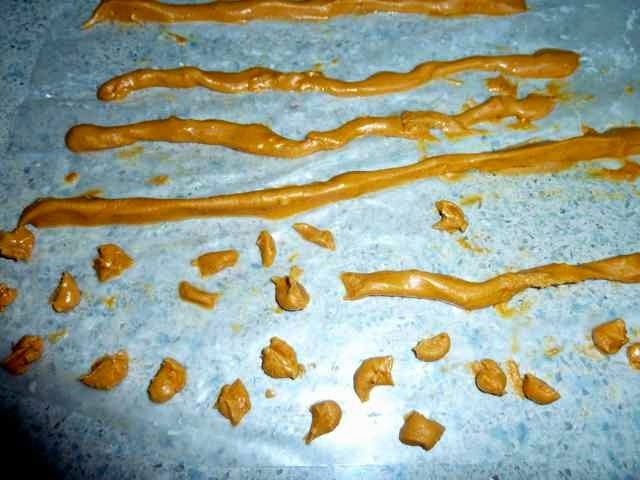 Store in a tin or plastic container, and separate layers of bars with waxed paper to prevent sticking. Well wrapped squares can be frozen and thawed later when ready to be eaten.